In the olden days, budding geniuses picked up a paintbrush or sharpened their quill. But judging by the preponderance of short films at the Turner Prize - supposedly an event for painters and sculptors - the camera now holds the key. So who exactly is going to seize the mantle of Scorsese, Lynch and Loach? Well, if you're curious about the efforts of up-and-coming moviemakers, you could hardly do better than head for Krakow when winter descends. The Etiuda and Anima Festival has been a beacon for young filmmakers since 1994, and a number of stars have made their name at the event, not least Oscar winner Florian Gallenberger. Etiuda swings open its doors to film and art school students across the globe. Young hopefuls compete for the coveted gold, silver and bronze dinosaurs. Feature, documentary and experimental films are all in the running. And if you're not shacked up at an arts school you're still in with a chance - amateurs also have a shot. Since 2005, the festival has broadened its horizons to include animated films. Professional, student and independent film-makers are all welcome. Contestants compete for jabberwockies, and there are prizes for both students and independents. The Anima section has proved such a success that it is now regarded as one of Europe's most exciting animated film events, with big name guests honoured each year. Besides the competition proper, and premieres of short and full length films from around the world, there are always many inspirational accompanying events. The 16th festival looks set to be another fantastic feast for film aficionados. Over 800 films from across the globe were submitted for the two competitions, and these have now been whittled down to 100. Special events to look out for are many. Jiri Barta, the celebrated Czech champion of puppet animation, will be the guest of this year's "Self-portraits of animation artists", demonstrating the art of animation live before the festival audience. Meanwhile Dutch star Gerrit van Dijk will be presenting gems from his country's animated past in the "E&A 10 best". French, Swiss and Basque films also get a look in, with a series of screenings of short and full-length animated works. As always, there will be a host of premieres at the festival. Look out for first screenings of films from creators such as Tom Morre, Gabor Csupo and Academy Award winner Adam Elliot. Likewise, Forest, the first full length feature of Polish star Piotr Dumala, is one to watch. Dumala's work will be accompanied by screenings of classics by masters such as ex-Python Terry Gilliam, and Walerian Borowczyk, guru of Polish animation. The famed Lodz Film School will also be getting involved, leading workshops for screenwriters, directors, cameramen and film editors. Finally, on the day of the award ceremony itself, viewers will have the opportunity to savour screenings from the famed "50 Champions of Animation" as recognised at the Los Angeles Olympiad of Animation 25 years ago. These include works by Polish masters such as Zbigniew Rybczynski and Walerian Borowczyk. This year, cinephiles can savour a host of inspiring extras alongside the main events. Japan and Hungary come under the spotlight in a combined review of classic animated films. There will also be world premieres of movies by seasoned masters such as Bill Plympton (Idiots and Angels) and Nina Paley (Sita Sings the Blues). Celebrated composer Normand Roger also comes into focus. This virtuoso seems to have the golden touch - of his ten films to be nominated for an Oscar, half came away with gold. Look out for some picks from the maestro's back catalogue this November. 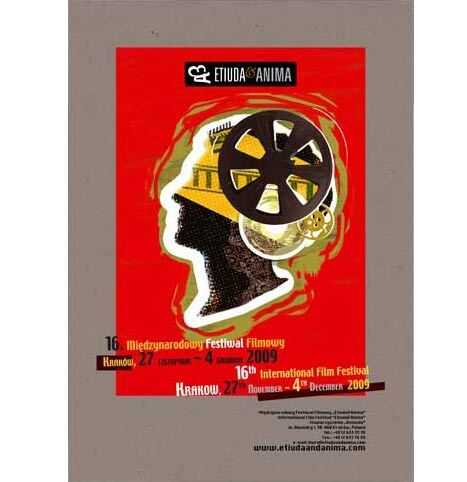 Alongside the Etiuda and Anima competitions, there's a smorgasboard of complementary events that are sure to tantalise Krakow's legions of film buffs. Krakheads can savour a selection of Germany's finest avant-garde films, and there'll be a special programme entitled '50 years of English Free Cinema'. On the animated front, a special Golden Jabberwocky will be awarded to Estonian legend Priit Parn (b.1946), creator of such animated classics as Night of the Carrots and Breakfast on the Grass. Mr. Parn is now a teacher at the Arts Academy of the Turku Polytechnic, Finland, and all his most acclaimed work will be screened during the festival. These animated aces will be complemented by short films by Parn's proteges in Turku. I'm coming just for this festival!!! It's gonna be great!